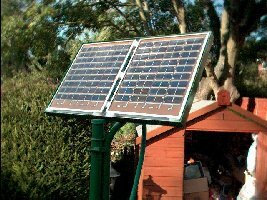 Simple solar power experiments can be set up and give a useful supply of 12volts for experiments in the shed, even on cloudy days the panel gives enough to top up the batteries and supply a float charge. It may also trickle charge some small 'AAA' batteries, so even cloudy days, are music days with this setup. 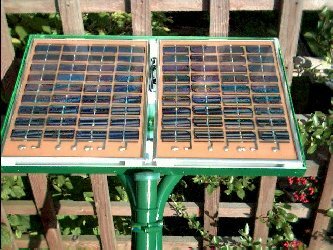 The left two photo's above are of the solar array and the right is of the control unit. 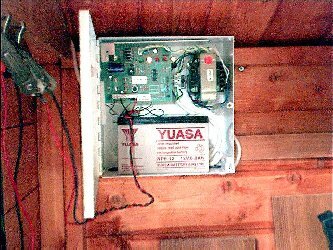 The battery is the small control unit battery, once this is charged the output is diverted to the storeage battery, which is about a 75 amp/hour capacity. 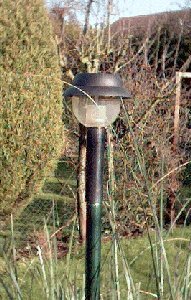 The simple array by shed 3 gives 750m/a in bright sunlight, but only 50 m/a on an overcast day, Hence the Controller that with only 15 m/a of power, controls which batteries get what power, when it is available. The constant trickle charge gives me power to play with for simple projects. I do like the fact that my mp3 player runs on rechargeable batteries that get charged for 'free' all year round. update this during 2004 as the installation matures. fun this one. See the project page for info and even why it was done. 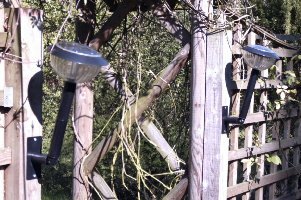 Carefully placed Solar lamps give marker indications in the garden for up to 3 hours of an evening.